Good morning and happy Monday! I hope everyone had a nice and restorative weekend. I hope everyone feels jazzed up about green soup, and all of the wonderful variations that can emerge from it. Last week, I found myself with an abundance of melon. Not only watermelon, which was teeming in my fridge and my freezer and very often being blended into a frosty, but also fresh cantaloupe. I tend to overlook melons a lot in the summer, largely because I’m so totally enchanted with berries that I can have eyes for no other kind of fruit. But cantaloupe is really lovely: sweet, light, rich in vitamins A and C, and very hydrating. 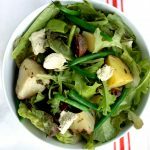 I often snack on it during hot summer days, but I was randomly inspired to put it into a salad, and I was really happy with the way it turned out. Originally, I was going to call this a “breakfast salad,” since that’s how I enjoyed it. But of course this could be an anytime-salad. 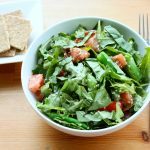 You can make it more complex with the addition of hemp seeds, legumes, or fresh herbs, but it’s very nice with this simple preparation, too. 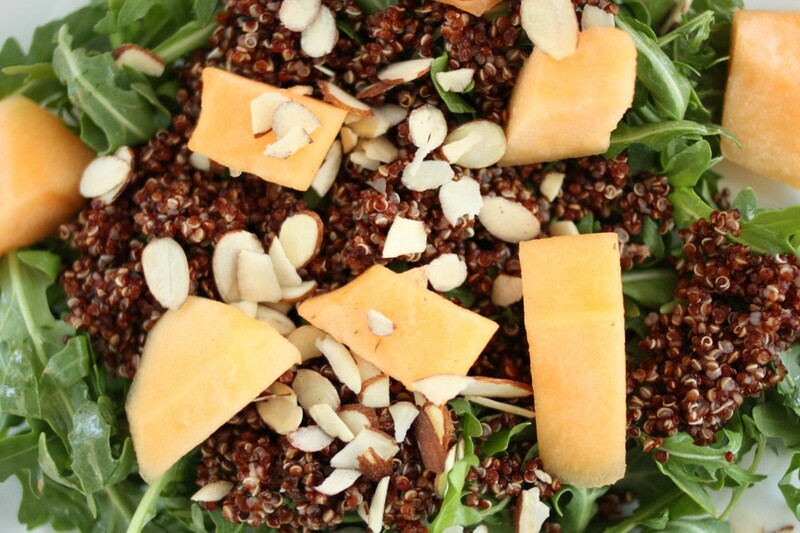 I love the way nutty, chewy quinoa contrasts with the juicy and mellow cantaloupe. 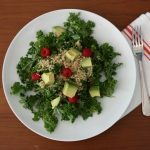 Almonds add crunch and seem to bring it all together; they’re a favorite for breakfast salads in general. 1. Whisk together the oil, vinegar, syrup, and seasoning. 2. 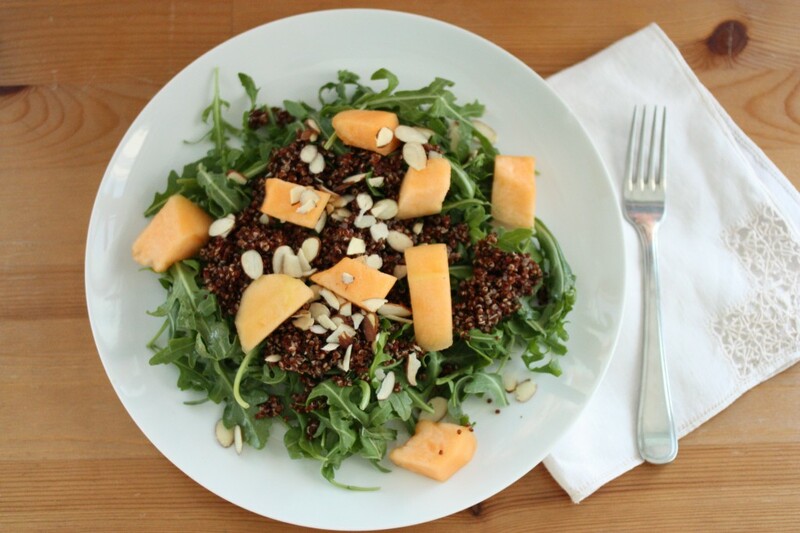 Divide the arugula, quinoa, and melon onto two serving plates. Sprinkle them with almonds and then drizzle the dressing over them. Serve 2. I hope you enjoy this salad, at any time of day. This week, I’ll be bringing you a summery new salad dressing, a bunch of quick lunch ideas, and a new restaurant review. I’ll see you soon. 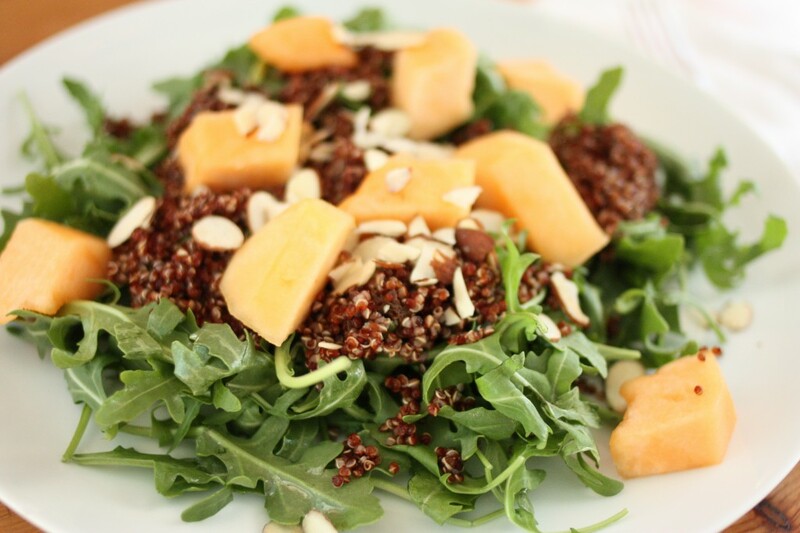 Love the combination of arugula, cantaloupe, and quinoa. Thank you for the recipe, Gena! 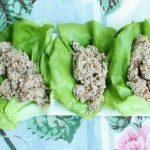 I’d like to try this with baby romaine since I’m not a fan of arugala. But I love cantaloupe and quinoa!! So funny! I was inspired to make a salad with melon last week too! I found these amazing organic french melons I’d never seen or heard of before – charentais – like a cantaloupe but slightly sweeter. SO good! I paired it with some shredded red beets and kraut over a bed of greens and a creamy cashew butter dressing. I can just see my wife drooling over these pictures. She has weight issues, especially after giving birth to our daughter several years ago. She is trying to find a diet that will curtail her eating habits despite having a genetic proclivity for obesity. I am supportive and suggest things to her when I See them. This one I will show her. I recommended to her a healthy diet, moderate exercise, coupled with nutritional and weight loss supplements. 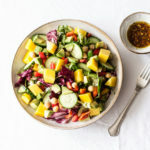 The combination of colors in this salad is gorgeous! The melange of spicy arugula, sweet canteloupe, chewy quinoa, and crunchy almonds must also taste amazing; I bet that toasting the almonds would add even more flavor. I can’t wait to try it! Thanks, Gena. Thanks for this. Great combination. 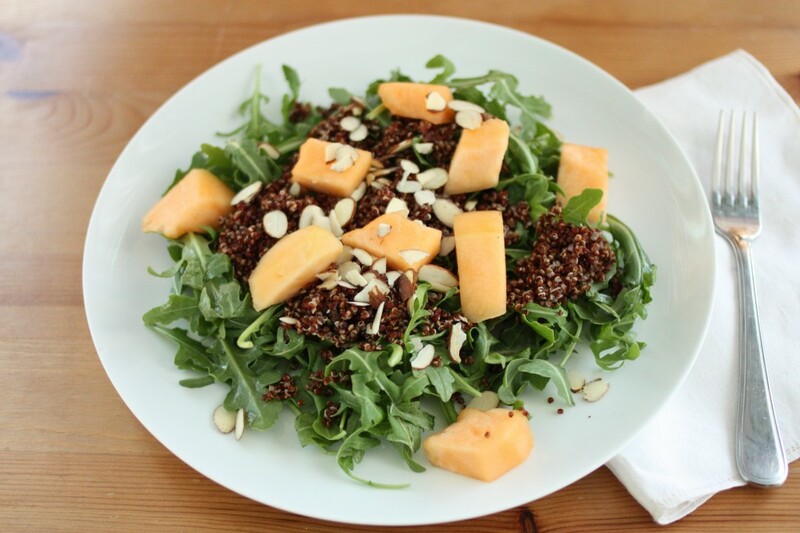 Would not have thought of cantaloupe and quinoa together. Will have to try this! Thanks for the inspiration! I am trying to use flax seed more in my cooking. Do you find the flavour overpowering? It’s distinctive, for sure. I wouldn’t call it overpowering. I kind of like the way it tastes! Cantaloupe is my favourite! Never had it in a salad before, this looks delicious. I don’t eat cantaloupe much anymore, but that’s only because I consumed my lifetime’s quota and then some in my 20s. I do love it though. Especially when perfectly sweet and perfectly ripe. That looks so delicious I wish I can have them as soon as possible. Just waiting for my wife to make these recipes for me as I can not do effort even on this salad making. Love this – I better hurry up and give it a try before summer ends. I’m not a huge fan of salads in the autumn/winter time. I’ve never thought to use cantaloupe in a salad. Clever, I’ll have to give this a try. I remember you used to blog about how you didn’t like fruit. TImes have changed! I am always reluctant to put fruit on my salad but then when I get it like that at a restaurant I like it in there. 🙂 My mom was mentioning that this weekend — she was impressed that I ate melon! (She’s been trying to warm me up to fruit since I was a kid.) I’m getting way better. Banana, apples, and berries are still my favorites, but last summer I challenged myself to mango, and this summer it’s melon. So far so good. I love fruit in salads…other than smoothies, probably my favorite way to eat them. The melon contrasts with earthy quinoa really nicely here. Actually, my blog is a mixture of cooked and raw recipes, so I meant cooked for this one. But sprouted would work, too!